THE big names may all be punk legends but the Undercover Festival II is anything but a nostalgia fest. The three-day event at Bisley Pavilion over the weekend of September 19 to 21 will also be jam-packed with young rising talent, including several bands where all the members are under 18. “This is a festival with a lot of punk bands but this is not just a punk festival,” stresses Woking-born promoter Mick Moriarty. Undercover was born last summer when GuilFest was cancelled and Mick and the team behind the original event’s Vive Le Rock stage decided to carry on at a different venue. The massive line-up includes legendary names like Spear of Destiny, UK Subs, Penetration, TV Smith, Chelsea, 999, and The Men They Couldn’t Hang – alongside new young bands like Gentleman’s Dub Club and The Dualers, plus lots of local acts like The Brompton Mix, The Sha La Las and Phoenix Chroi, all from Woking. Mick says the bands have been selected because they’re “more genuine than the sanguine X Factor rubbish out there today”. He adds: “By and large punk and ska is from the streets and not the cheque book of music moguls like Simon Cowell. 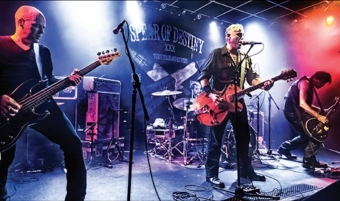 Undercover is obviously a passion for Mick and he enthuses while running through the line-up, declaring himself “pretty chuffed” to have landed Spear of Destiny, still fronted by Kirk Brandon. He’s just as enthusiastic about the young talent coming through, including When We Run, RISK, SkaCiety and particularly AMI from Brighton who are fronted by…Charlie Harper’s grandson! But amassing such an impressive line-up has not been easy. Mick says: “A lot of agents were taking a liberty and some of the money being asked was ridiculous especially as we are a small festival, and if we paid what they were asking ticket prices would have gone through the roof, which is really not what we’re about. But with 60 acts across two stages and free camping and campervan spaces on offer, it should be a hectic weekend. Mick says he can’t decide who he wants to see most. THE Undercover Festival II will be at Bisley Pavilion, near Woking, from Friday to Sunday, September 19 to 21. More details are available online at www.undercoverfest.com.